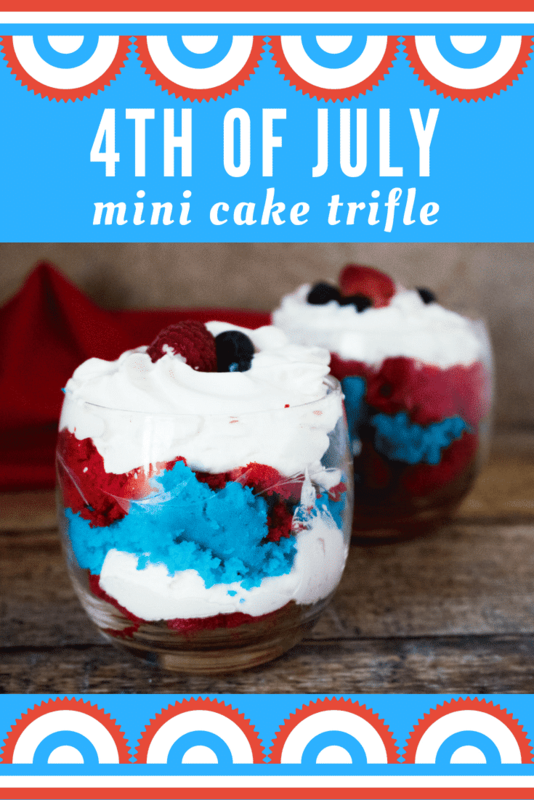 4th of July Mini Cake Trifle is a colorful and flavorful dessert that is super quick and easy to make! A feast for the eyes as well as the palette, these vibrant 4th of July desserts combine sweet, moist, brightly-colored cake crumbles with layers of light and fluffy cream cheese mixture to make one perfectly patriotic treat that will be the star of your Independence Day holiday table! Trifle is a classic English dessert that typically consists of sponge cake soaked with wine or spirits (such as brandy or rum) then topped with layers of preserves, custard, and cream. The word trifle comes from the old French term “trufle,” meaning false or idle tale. This decadent dessert is traditionally served in a large glass trifle bowl, since the intricate layering makes for an impressive and decorative presentation. Tip #1: For a casual, outdoor, summertime vibe, serve your 4th of July Mini Cake Trifle in small jelly jars. To make them truly portable and mess-free, use the lids that come with the jars. Tip #2: If you’re feeding a crowd, pick up some of these cute, disposable plastic dessert bowl and spoon sets. The perfect solution for any holiday barbecue, picnic, or pool party. Make both cake mixes according to package directions for using an 8-inch pan. Once baked, set aside to cool. Then, mix the cream cheese until beaten smooth, and add in the whipped topping. 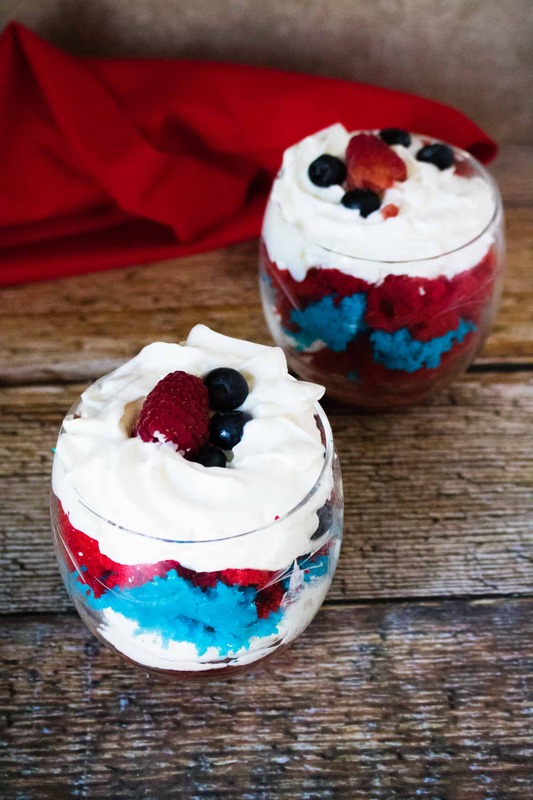 In jars or dessert dishes, build your trifles by alternating layers of crumbled-up red cake with the white cream cheese mixture, and then the crumbled-up blue cake to create red, white and blue “stripes.” Garnish with fresh berries, if desired. The number of individual 4th of July desserts this recipe makes will depend on the size of jars or serving dishes being used. 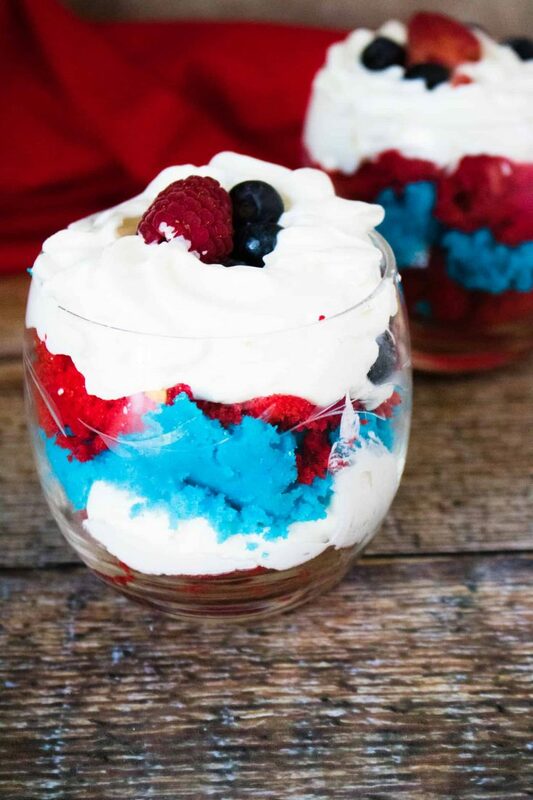 Show your patriotic pride with this easy-to-make, fun and festive sweet treat! Make both cake mixes according to package directions for an 8-inch pan. Set aside to cool. Mix the cream cheese until beaten smooth and then add in the whipped topping. In jars or dessert dishes, alternate layers of crumbled-up red cake, white cream cheese mixture and crumbled-up blue cake to create red, white and blue "stripes". Garnish with fresh berries, if desired. Note: total number made depends on the size of jars or serving dishes being used.